Yep, I again had a motive for assigning this weeks challenge - it's my 17th Wedding Anniversary on Sunday - thus this weeks Bloggers Challenge - Falling for You. For today's card, I used my DoodleFactory Great Outdoors set and the Camouflage Technique from the October TJNL. 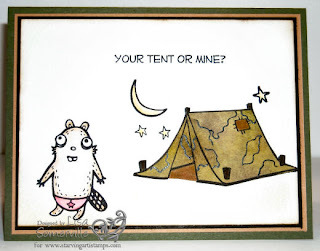 I think when Tracey introduced the DoodleFactory Great Outdoors, she had them made just for my family! What you can't see on this card is the sponged edges and the dirt under the tent - I used a lighter color ink for the sponging and it didn't pick up in the photograph. If you'd like to play along with this weeks Blogger Challenge, leave a link on this post to your creation, or if uploading to SCS use keyword BC67. Looking for some inspiration - check out what the Bloggers Challenge Group created. That's cute Lisa, love the sentiment on it!!!!! Congrats! Great way to use the tech, luv the card. bwahaha....how cute is this! What a fun sentiment. Such a cute card!! Love it! Lisa, this is too cute and that sentiment always gets a chuckle out of me! Cute card--I really like camouflage technique and can't wait to try it. really cute!! happy anniversary to you!!! Love it. It is hysterical. May have to look into that stamp set. Such a cute card Lisa - Happy Anniversary! Great Card Lisa, It's clever and fun all in one! I'm glad I found your blog - I'll be back again and again! this is soooooo cute! love the tent too, must try that technique sometime...thank you so much for sharing! lol - this definitely gave me a chuckle this morning! love it!! Happy Anniversary!! Very fun! Happy Anniversary...quite the milestone! Adorable card....so perfect for an Anniversary card! October is a GREAT month for anniversaries, isn't it?!! Happy Anniversary to you and hubby! Love it, Lisa! The DoodleFactory images are so much fun to use.